My name is Kelly McBride, and I am majoring in Classics and French with a minor in Visual Arts. I have taken 7 years of Latin and a year of Ancient Greek, and I have extensive experience with Ancient Greek and Roman cultures. I also have been developing my studio art skills for the last five years. I believe that this project will be a great opportunity for me to bring together my love of the Classics and my artistic skills. Dr. Alan Shapiro discusses red figure vases in the museum collection. And so it begins. Apprentice met master and student encountered teacher in this our first week of the 2015 spring semester. Fourteen students gathered in the Johns Hopkins Archaeological Museum in Gilman Hall this Thursday afternoon and became acquainted with the project we will be undertaking this semester. Professor Balachandran began by outlining the exciting endeavor on which we are to embark, and then detailed the responsibilities we have as students and apprentices. She explained the challenges we face in our attempt to recreate the methods and techniques that the ancients used in the creation of pottery. With the course fully explained, she treated us to a display of some kylikes from the museum’s own collection. Our collection has a rather interesting history. These treasures have been in Baltimore since the late 19th century, and were sold to then Hopkins professor Arthur L. Frothingham Jr. by the German scholar and dealer, Paul Hartwig. In a fascinating letter dated to 1887, Frothingham exclaims, “What a wonderful place Rome is for antiquities!” and encourages university president Daniel Coit Gilman to acquire funds for two excellent bronze statues available for sale. While the statues were not secured for the Archaeological Museum, the vases that he mentions in his letter were. They were displayed at the Peabody Institute in the early 1890s and then transferred to McCoy Hall at the old Johns Hopkins campus by the early 1900s. A catalog prepared in the late 1890s of the vases has been lost for now, but will hopefully turn up in the university archives. Despite the intriguing shroud of mystery that covers the collection’s origins, its contents are exemplary specimens of the kind that our class is attempting to match. The opportunity to examine these kylikes, or cups, up close was truly breathtaking. Not only was the painting rendered beautifully, but the workmanship of the pottery itself makes the idea of matching such skill daunting. The slip (refined and thinned clay) that the Greeks used to “paint” with creates such an incredible sheen over the clay that it is hard to believe they did not use any glaze like modern potters. It is appropriate to create drinking cups I believe, since as Kathleen Lynch points out in her discourse on “Drinking Cups and the Symposium,” that we read this week, food was not so important to the Greeks as drinking, and their symposia revolved especially around the sharing of wine and ideas. These were not mere cups, but an integral part of the culture of symposia, from which great thought has sprung. Looking at red-figure cups with Dr. Shapiro. 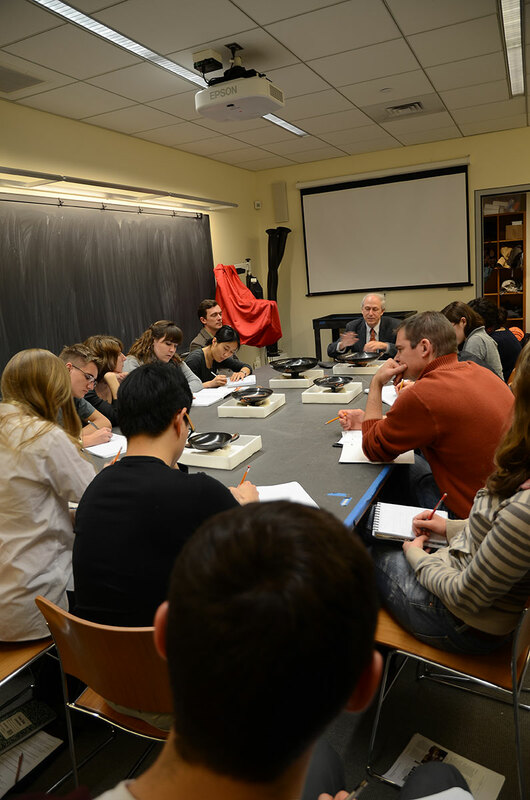 Near the end of class, we were fortunate enough to hear from Professor Alan Shapiro, noted scholar of Greek art. Professor Shapiro sketched out a brief history of ceramics in Ancient Greece. He explained that the phenomenon of painting figures on pottery was known in the Bronze Age, but inexplicably lost ca. 1100-800 BCE. Around 750 BCE, figure drawing began to reemerge. The golden age of true black-figure painting, which uses slip to make an all-black figure with incisions made to create details, begins and continues until around 530 BC, when someone invents the red-figure technique. This is a reversal of the black-figure technique, with the figures “in reserve”, and the areas all around them painted in slip. Our examples were created during the last thirty years or so of the 6th c. BCE, and the red figure technique is what we will try to recreate. With this knowledge in mind, we now embark on our journey into the past and plunge right into the world of the Ancient Greeks. It was great to listen to and talk with Professor Shapiro; learning more about the kylikes and their forms will hopefully be helpful when we start shaping cups with the clay ourselves. Although one thing that Professor Balachandran said that really stuck with me was about how the cups fit the hands perfectly when they were held. That makes perfect sense after finding out about how drinking was a more important part of Greek culture than eating (as mentioned by Kathleen Lynch in her discourse). You say that it is appropriate that we create kylikes, as they were an integral part of the symposia that were so essential to ancient Greek culture. I fully agree with this idea, but would like to expand it somewhat. I believe that another aspect of the kylikes that makes them a fitting form for us to reproduce is their personal nature. Both of our lecturers on Thursday touched upon this idea, Professor Balachandran mentioning that their size and form render them easy and comfortable to hold in one’s hands, and Dr. Shapiro discussing the potentially personal nature of the decoration, especially on cups with named figures. Since we will be working so closely with the cups and establishing our own personal relationships with them, both in the museum and in the studio, I think that it is extremely appropriate that we use such a personal type of vessel. Bringing in the wisdom of Professor Shapiro was a wonderful way to introduce the history behind our project. He and Professor Balachandran were really able to bring our attention to some of the design details such as impressions, inscriptions, and matt purple paintings that were described in Brian Sparkes’ chapter, “Greek Painted Pottery” in Making Classical Art. One of the most intriguing comments Professor Shapiro made during our discourse referred to our lack of knowledge regarding the technique painters used to draw in details with lines no thicker than a horse’s hair. Perhaps this is one of the mysteries our group of apprentices will be able to solve! Another noteworthy piece of information is that all of the cups that we were looking at are known as Attic ware. This means that they were all originally created in or around the area known as Attica (the area surrounding the city of Athens). Attic ware is very distinctive from ceramics from other locations because of the natural red color of the fired clay. This reddish color is a result of higher levels of iron found in the natural clay deposits from which the raw clay was collected. This makes it much easier for archaeologists to provenance these kinds of ceramics. Kelly pointed out that “these were not mere cups”. I think the most interesting clue that these cups were more culturally significant than regular drinking vessels was an image in one of the kylikes we saw. The Phintias cup depicts a customer buying a kylix. The fact that there is an image of a kylix on a kylix is a huge testament to their importance. Thank you Kelly for the informative post. The reversal of the figure coloring is very interesting and brings to mind the term “negative space” used in the art of drawing. It is when one focuses on drawing an object by first filling in the parts that are not the object. This gives a sort of silhouette of the object and helps to make the drawings more accurate. Perhaps, the ancient greeks knew of this idea too and tried it with figure coloring. I have seen and studied ancient pottery before but this week was the first time I had ever appraised it with the intention of replicating it. The thought of recreating any ancient pottery is daunting, but Greek ceramics are on another level. Pictures do not do the kylikes in the museum’s collection justice. They gleam in an almost metallic way and the contrast of black and red make the colors look so rich despite their age. Attaining these characteristics in our recreations will likely be difficult, but not impossible. Kylikes, like some in the museum’s collection, could be signed by the ancient potter or painter, and it’s exciting to realize that instead of studying those names, this time we will be writing our own. As others have already mentioned, one of my favorite moments during the lecture was learning that these kylikes were created to be comfortably held in one’s hands. I especially enjoyed Professor Balachandran’s comparison of these cups to our modern-day coffee cups. For me, this highlighted the importance of these pieces of works as both a functional object and as an important part of the daily ritual of ancient Grecian life – just as coffee has become an integral part to modern daily life. Thanks for transcribing our first class for the growing archives of this course, Kelly. We all share the daunting and empowering responsibility of caring for these objects and recovering information that has been lost, both from the process of Ancient Greek potters and painters as well as the records at the Archaeological Museum. As we move forward, I think it will be important to maintain a certain level of skepticism of perceived facts and unanswered questions. While our main objective will be to catalog and analyze the work of others, we should also remember that our own work must be approached with care and recorded for future scholars and apprentices to register our appreciation for these works. Yes, we are observing history from a distance, but our attention and closeness to the objects diminishes the gap. What a great start to this blog and for the course! The kylikes which we saw in class depicted a variety of scenes, ranging from the mythological to the mundane. Some are even dedicated to the beauty of certain individuals. It will be interesting to consider what subject should be painted on our own reproduced kylix if we keep to the spirit of Ancient Greek decorators. What in modern American (and more specifically, Hopkins) culture would make it on pottery? It’s interesting to consider how our modern phenomenon of celebrity compares to ancient admiration of mythological characters….not to say that an image of Kim Kardashian would emerge at the bottom of an emptied modern kylix. I’m also curious about the personal significance behind these objects, and how they vary. In present time, one example of a personal object that comes to mind is a cell phone; it serves the same function for everyone and is used on a daily basis, but can be customized in both internal content and external appearance. I completely agree with what Kelly said about the idea of recreating a kylix is a daunting one. Looking at the cups in class on Thursday it became evident that they were not only works of art, but also carefully engineered constructions. The wide bowl sitting atop a thin stem and small base gave each cup an air of unearthly weightlessness, an effect that I am sure will prove to be a challenge to recreate. What is also striking is the durability of these vessels. Although cracked and incomplete in some cases, these vessels still retain their luster despite being millennia old. As Harry Langford Wilson wrote in The Classical Weekly (1908), “Nothing has more power to […] awaken and sustain their enthusiasm than the constant presence of the tangible remains of antiquity, the actual works of Greek and Roman hands.” Indeed, this premise of Recreating Ancient Greek Ceramics to interact with and create the very pottery sitting in the Museum’s cases was exactly what caught my eye about Professor Balachandran’s class. We will be taking an ethnoarchaeological approach to studying the collection of kylikes at Hopkins. Our ethnographies will be learning the ancient Greek methods of pottery production at Baltimore Clayworks, and we will be building our very own replica kiln. I am especially looking forward to working in the JHU Archaeological Museum. Thanks, Kelly, for the lovely introductory blog post you have written. 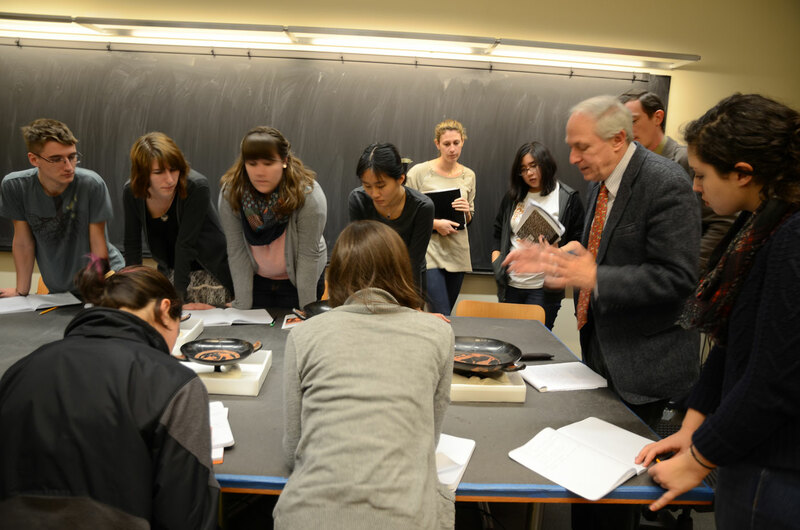 Combined with having to request access to this course, and the daunting forewarning we received about the time commitment that would be necessary, it certainly felt like we were about to “plunge” in head-first into the world of ancient Greek ceramics. I had no idea of the beauty of these cups. Imagine me, with my fraternity’s Greek letters on my shirt, viewing actual, inscribed-by-a-Greek letters on an ancient object. And then to learn about the man who inscribed them, via Prof. Shapiro’s great introductory lecture. I felt a connection that was transcendent of time.